In the mid-eighteenth century the physical configuration of Porto continued to be, essentially, the old medieval village with farms and rural gardens crossed by dusty roads. Only when João de Almada e Melo (a cousin of Marquês de Pombal) was sent to Porto to put an end to the “Tavern keepers’revolt “, an insurrection related to a wine monopoly put into practice by Marquês de Pombal, did the important changes take place. As part of the urban renovation of the city carried out by João de Almada (1757-1786 ) as Director of the Department of Public Works, a new artery from Campo das Hortas to Praça de Santo Ovídio, which made the connection to the city of Braga and Guimarães easier, began to be constructed. It started in 1761 and extended along the second half of the eighteenth century. Rua do Almada( the lower part of the street continued to be called Rua das Hortas) was crossed by Rua da Fábrica do Tabaco and Rua dos Lavadouros, in addition to some other streets. This 805 metres street belongs to 3 parishes: Cedofeita, Vitória and Santo Ildefonso. The implementer of this project was the military engineer Francisco Xavier do Rego. This was not only the first street built outside the 14th-century Romanesque wall but also the first street to have sidewalks and door numbers. It was in this street that the great tradition of the errand boy was born. It was a very special mercantile street that has always been linked to the iron trade and the like. In some trading houses the wagon rails used to carry the heavy goods can still be seen, as well as the granite floor slabs thus made to withstand high loads. Here lived in the eighteenth and nineteenth centuries the bourgeoisie of Porto. The “pretty girls” of the street could be seen on the wrought-iron balconies. In the evening came the dandies riding their chestnut horses to court them. It was how the famous writer Camilo Castelo Branco saw Ana Plácido for the first time. She lived here at No. 289 with her parents and later at No. 378 with her first husband, Manuel Pinheiro Alves. At the corner of Rua do Almada and Rua dos Clérigos was Lino’s, that sold sports items, weapons and utilities. Late in the afternoon it was a meeting place of intellectuals. In this same street lived the well known philosopher Teles de Albergaria, who died in the republican insurrection on January 31, 1891, as well as the painter Inácio de Pinho, the son of an ironmonger who on the floor above his father’s shop Pinto & Bezerra, organized a literary circle. In the existing guesthouses lived temporarily the poets Teixeira de Pascoais and Soares de Passos. Another famous resident was Sofia de Outeiro, who led the poet Jaime Artur to suicide. 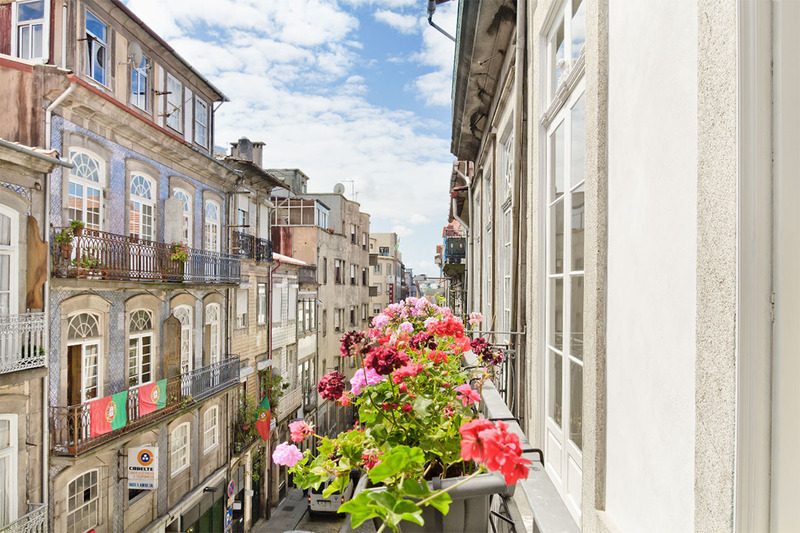 It was the rehabilitation of one of these buildings representative of the Almada period, with its hardware store, granite floor slabs and the typical wrought iron balconies, that originated the charming building that houses the Port Lounge Hostel & Guesthouse.